I was absolutely determined this time to carry a hairdryer and have hair that looks nice and polished each day. That was not meant to happen. Be careful what you wish for. I am carrying only a 50-L carry-on duffel bag that converts to a small backpack and after logging in around the Miami airport for a day and walking 5 or 6 miles in one day just to find a plane out of Miami and another 5 miles the next day to get somewhere, I was feeling the load. I was wishing my backpack would be lighter and have more room. But there was nothing that I wanted to part with. I had packed carefully, frugal with space, and deemed everything I had to be an essential. 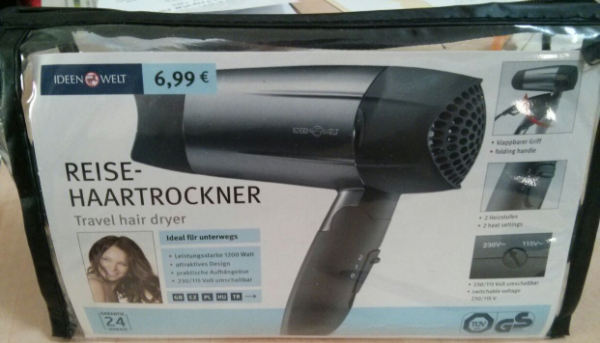 I remembered to change the voltage so the hairdryer would work in the United States. Then I remembered to remember to change the voltage back before I used it in Europe – until I forgot. Exhausted upon my arrival in Sicily after too many days of unnecessary travel I plugged in my hairdryer, last used in the US so set to 115v, and just started to use it. In 10 seconds it was red hot. Just as I noticed it, in about 15 seconds total it stopped working. The European voltage of 230 or 240 overloaded it at this setting. It has been a couple of days and I have tried it a couple of times. In one moment it turns red hot and stops working, then it is so hot that it takes a very long time to cool down. The hairdryer is dead. All I can do now is place it in the trash so it doesn’t hurt anyone. I borrowed scissors from the front desk and cut the cord so no one will be hurt trying to use it. Then, with sadness, regret, and a sense of failure I unceremoniously placed it in the otherwise empty garbage can. I now have extra space in my backpack. I should’ve been careful what I wish for when wishing for more space. However, I did wish for a hairdryer. I suppose I need to better prioritize my wishes. I was determined to look good during this entire trip. I suppose as a backpacker I am never meant to look normal. I cannot say that I like American Airlines as much anymore. Time to better cut my hair to look better without blowing it. I am still keeping my great hair brush though. There will be access to other hair dryers from time to time.